Make a donation to Juke Box Hero today. Film Independent’s Fiscal Sponsorship program opens the door to nonprofit funding for independent filmmakers and media artists. Donate today and help bring Juke Box Hero to life. An aspiring rock star fights a mental breakdown along the road to stardom while pursued by a dysfunctional romantic. Drawn together and torn apart through humor, heartache and hope, the two grapple with the healing power of friendship and the damage wrought by demons of childhood. 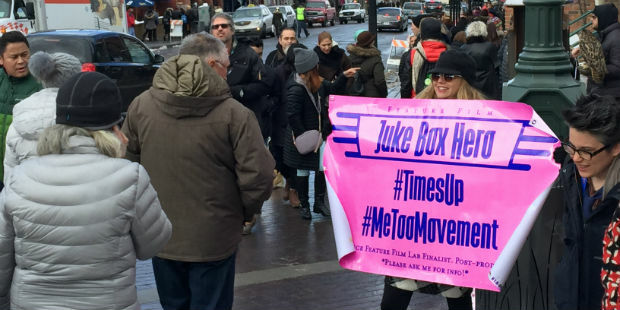 This #metoo / #timesup movement film is a visceral and psychological ’80’s rock and roll drama tapping into latent fears in our society that both attract and repel. Juke Box Hero portrays the unlikely companionship of Kiva Jade, an alluring and\ brazen musician, driven to become a multi-platinum superstar in the counter-culture world of rock and Allan Crossley a humble nursing home caregiver with a golden heart. The film explores psychological and physical abuse in a lonely young man who reaches out with misdirected attempts at self-expression, and genuine acts of kindness. He longs to connect with brunette rock goddess Jade, while her own muddled regression into past abuse leaves a wall between them. At times attracted to each other and sharing moments of happiness, they progress further along into dangerous and uncharted territory until each of their lives collapses. As inner resources dwindle and outside support fails, they are forced into the waiting arms of the judicial and mental healthcare establishments to abandon their notions of normal life, relying on systems they don’t understand for survival. The potent and complex forces that propel their lives potentially become the crucible for the precarious passage into adulthood. Make a donation to Juke Box Hero. AFI’s Directing Workshop for Women finalist. Panavision’s New Filmmaker Grant. Juke Box Hero, is a two-time Sundance Film Lab finalist. Directed actors such as Frances Fisher, (Titanic), Brendan Sexton III, (Three Billboards Outside Ebbing, Boys Don’t Cry), Zelda Williams, Michael Traynor (Walking Dead), Jade Tailor (The Magicians), and Nolan Gould (Modern Family). Acting with Joanne Baron/DW Brown Studio and Groundlings. Past clients; Red Bull, Body Mints, Fox Fuel Television, First Hawaiian Bank, The Triple Crown of Surfing. VR directing award, “Best in Show” (SFVR), “Best Design” at Google’s Tango hackathon. Named a Top 40 VR Twitter influencer and Top 101 Women Leading the VR Industry. Christopher Kawika Brown is a graduate of Washington State University where he split time studying materials science and journalism while dabbling in crime and punishment. His escapades include: stints in the Caribbean, South Korea, Washington D.C., Rock Springs WY, and Mainland China. In these settings and parts unknown, he spent time as an English teacher, a brewer of especially intense home-made beer, a pizza chef, a sometimes salaried Drive-In Movie theater-goer, an essayist, a rugby hooligan, and a songwriter/wedding signer. He has lived in a Trinidad & Tobago mansion patrolled by vicious land-crabs, in a Korean yurt, and a rusted green 1979 Subaru GL-10 Wagon. Chris currently teaches Hawaiian culture in Paris, France and is publishing the collection of personal essays “Out of the Desert” and “Into the Pastureland” chronicling the exploits of a progressive gypsy. Born and raised in the Central American country of Costa Rica, Francisco Bulgarelli enrolled at the Castella Conservatory Arts School at the early age of nine, He continued his art studies at Universidad de Costa Rica and UCLA ext. Francisco has shot features, short films, music videos and commercials. He recently wrapped the feature Juke Box Hero for director Shero and the short film Mandevilla for director Andrew Oh. Early in 2012, Francisco shot the feature Dreamer for director Jesse Salmeron. Among other work, in 2010 Francisco shot the 35mm anamorphic feature film, The Ghastly Love of Johnny X for Director Paul Bunnell (Featured in the March 2010 issue of American Cinematographer) and in 2011, Innocence Blood for directors DJ Holloway and Sun Kim. Currently prepping Endgame for Director Carmen Marron.